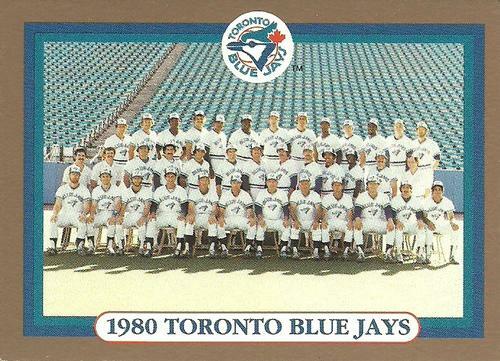 The 1980 Toronto Blue Jays certainly put a dark cloud over the Milwaukee Brewers practically every time the two teams played that season. In 13 meetings, Toronto posted an 8-5 record over Milwaukee, scoring 53 times while allowing just 41 runs. The Brewers were known as offensive bashers. This was the team nicknamed “Bambi’s Bombers” as a nod to their manager George Bamberger and his free-swinging philosophy. But it must be noted that 1980 was the year that Bambi had heart surgery in spring training, and didn’t return to the dugout until early June. Coach Buck Rodgers ran the Crew in Bamberger’s absence, and navigated the club to a contending 39-31 mark. While his methods were different than Bamberger’s running both the offense and the pitching staff, he did get results in his stint. It wasn’t until 1982 when Rodgers was manager (without the interim tag) that everything unraveled, leading to his dismissal. Harvey Kuenn took over, the “Wallbangers” were born, and the Crew pushed their way into the World Series. But back in ’80, things were a bit different. Milwaukee was expected to contend for the AL East title. Toronto was just a couple years into their existence and figured to end up at the bottom of the division. The Blue Jays were led by manager Bobby Mattick, who actually played for the American Association Milwaukee Brewers in 1939. Mattick returned to the big league Brewers as head of player development in 1970-71, and was credited for the development of players such as Gorman Thomas, Sixto Lezcano, and Darrell Porter. Milwaukee went 9-3 and 10-3 against Seattle and Cleveland respectably in 1980, but that was what they were supposed to do – beat up on weaker teams. They had their hands full with the New York Yankees and ended up playing to a 5-8 record in head-to-head competition. But this wasn’t surprising considering the Yankees were on their way to a 103-59 record and the division title. Milwaukee finished the season in a distant third place at 86-76, nine wins less than in 1979. So what exactly happened to make the 67-95 Toronto Blue Jays play Milwaukee to the same head-to-head record as the powerhouse Yankees? It really was a combination of Toronto’s timely hitting and Milwaukee’s inability to score runs in a number of the contests – especially early in the season. Toronto was beginning to realize they had a couple great arms at the top of their rotation in Dave Stieb and Jim Clancy. The Brewers hitters had their hands full with those two guys, plus future teammate Paul Mirabella (1987-90) proved to be a challenge as well. Clancy did set a Jays franchise record that season by walking 140 batters. He went 13-16. Stieb was 12-15 and both had ERA’s under 4.00 on the year. The Brewers had a good pitching staff and five pitchers finished with double digit wins by the end of the season – Moose Haas (16) Mike Caldwell (13), Lary Sorensen (12), Bill Travers (12), and Reggie Cleveland (11). Team ERA’s were not that far apart – Milwaukee was 3.71 and Toronto was 4.19. Neither team had a true closer. In fact, Toronto had seven different pitchers record a save, and no one on the staff had more than eight total. 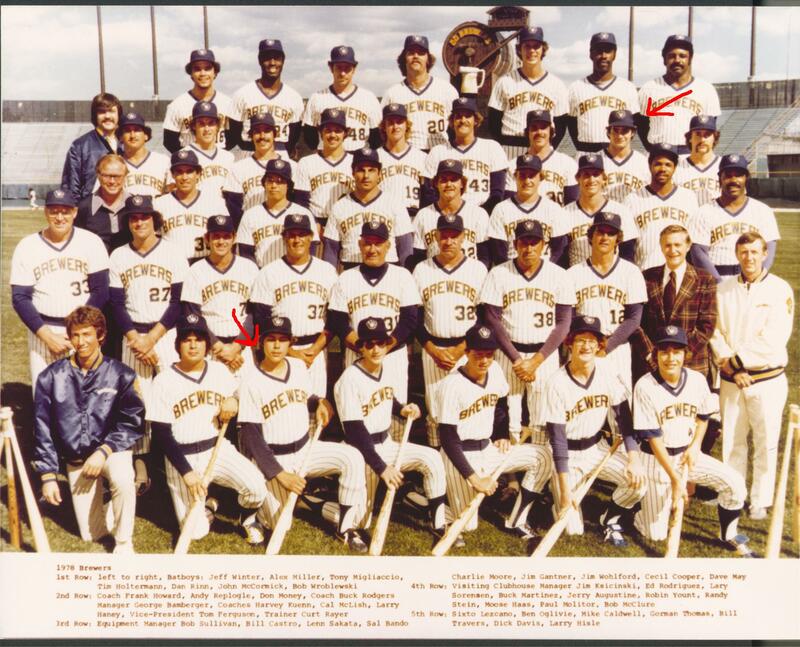 In the pre-Rollie Fingers era, the Brewers were in the same boat as Toronto. Nine different pitchers nabbed a save, led by Bob McClure with 10 and Bill Castro with eight. Even starters Mike Caldwell and Lary Sorensen each wound up with a save in 1980. Milwaukee opened their season at home with a huge 9-5 walkoff win over Boston, and followed that up with a ton of offense in an 18-1 win. Boston took the final game of the series, and the Brewers took off for Toronto and a two game set. Meanwhile, Toronto opened up with three losses out of four games in Seattle. This set up the Wednesday home opener with the Brewers, and Dave Stieb took the ball against Jim Slaton. The Blue Jays scored four runs in the first two innings and never looked back on the way to an 11-2 win. Steib scattered six hits and three walks on the way to a complete game. 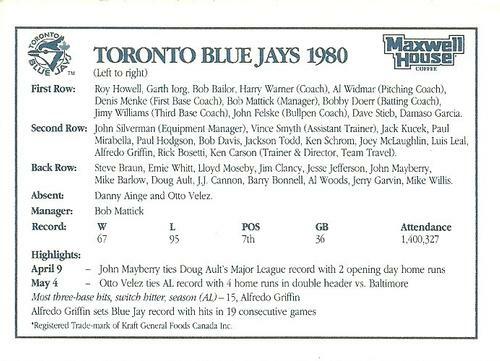 Only 12,688 fans were in attendance at Exhibition Stadium to see such a great opener by their Blue Jays. But Toronto was not an offensive juggernaut, and would score just 624 runs in 1980 compared to Milwaukee’s 811. First baseman John Mayberry powered the offense with 30 homers and 82 runs batted in, but Toronto didn’t have a .300 hitter in their lineup, save for almost everyday left fielder Al Woods, who fell short of 500 plate appearances. Second baseman Damaso Garcia hit .278 and was also a bright spot, but shortstop Alfredo Griffin hit .just 254. Unfortunately for the Jays, his best offensive years would come in the mid-80’s with Oakland. When fans remember the Brewers hitters of that time period, they think of a more balanced offensive attack from guys like Robin Yount, Paul Molitor, Gorman Thomas, Ben Oglivie, Cecil Cooper, and Sixto Lezcano. Yet none of the Brewers offense showed up in game two of the series, and Toronto won 1-0 on a ninth inning homer by center fielder Rick Bosetti off starter Lary Sorensen. It was a frustrating end to a four hitter by Sorenson, who retired the first 16 Blue Jays hitters he faced. In the sixth, Damaso Garcia beat out a grounder hit between short and third for the first Jays hits. Paul Mirabella went the distance for Toronto and worked around some jams, including runners at first and third with two outs in the sixth, and bases loaded in the seventh. It was Mirabella’s first shutout and complete game win. Buck Rodgers had been juggling his lineup around in an effort to produce some hitting, and had even dropped slugger Gorman Thomas to eighth. But it didn’t make a difference. The next day Milwaukee could only muster five hits as Dave Stieb and Mike Caldwell locked horns in a great pitching duel. 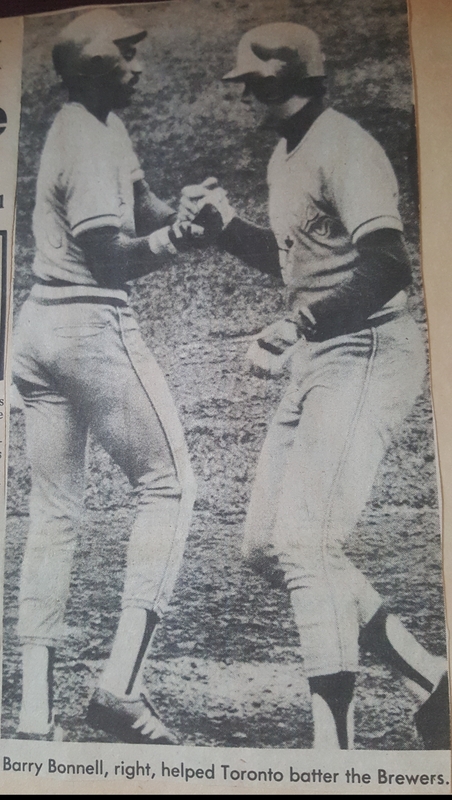 Both starters pitched the full nine innings and Toronto won on a grand slam by right fielder Barry Bonnell. Caldwell allowed just five hits going into the ninth when everything unraveled. Bondell said he couldn’t think of anything “more fun to do” than hit a grand slam on Caldwell’s fastball down the middle. Final score: 4-0, Toronto. Milwaukee hadn’t been shut out at County Stadium since August, 1978. At the end of April, the 7-8 Brewers found themselves looking up in the standings at the 9-7 Blue Jays. It would be a lot warmer the next time the two teams met in 1980. Milwaukee visited Toronto on Saturday, July 12, to start a four game series, including a Sunday doubleheader. Milwaukee had since turned things around with a 16-12 May and 18-10 June. George Bamberger was back in the dugout leading the team. Toronto went on to win the first game of the doubleheader by a score of 4-1, but Milwaukee came back to win the second game 4-0. Barry Bonnell again bothered the Crew with a homer in the first game off Moose Haas to lead the Jays to victory. Al Woods had a homer of his own, also off Haas. The ball stayed in the park in the nightcap. Gorman Thomas had three doubles to lead Milwaukee’s offense. The Monday game was a 6-4 win by Milwaukee. Gorman Thomas hit his 18th homer and Ben Oglivie his 23rd to lead the Crew. Jim Clancy made it into the ninth inning for Toronto, but took the loss and fell to 7-7. Toronto held a 6-3 lead in the season series to that point. It was little consolation for the 35-47 Blue Jays who were well behind the 48-36 Brewers in the division standings. I have a habit of feasting on Brewers pitching! The two teams met for one final series at County Stadium in August. Milwaukee was coming off a weekend series that featured a Sunday doubleheader against Cleveland. After a day off on Monday, they played yet another doubleheader with the Jays on Tuesday. The twin bill wasn’t kind to the Brewers as Toronto won both games. Jim Clancy outdueled Lary Sorensen in the first game as both pitchers threw complete games. 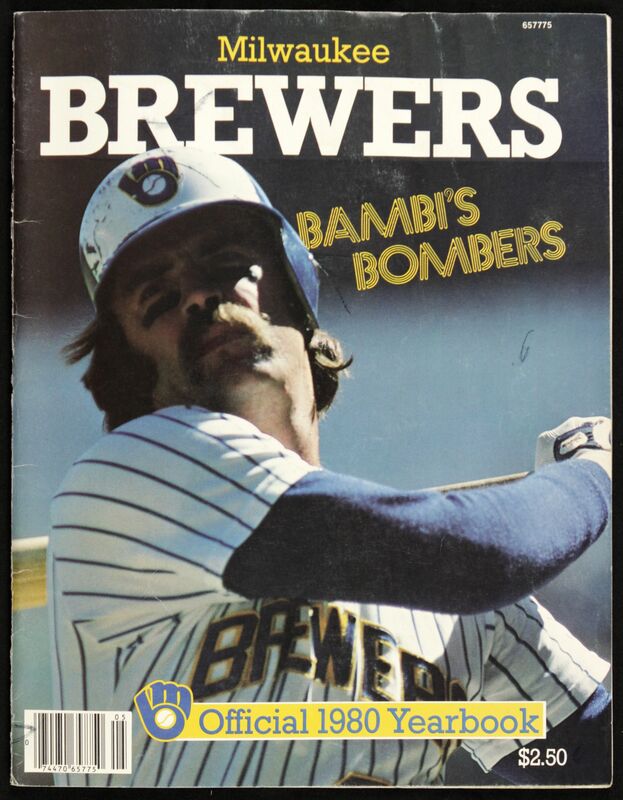 Jim Gantner hit a rare homer – his third – which amounted to all of the Brewers offense. Toronto scored two runs in the eighth and hung on for a 3-1 win. Both teams had plenty of opportunities to score more runs. Toronto wound up stranding 10 runners and Milwaukee had 8 of their own left on base. The nightcap featured Jack Kucek on the mound for the Jays against Paul Mitchell. Toronto struck for three runs in the top of the first inning on a walk to John Mayberry, single by Otto Velez, and back-to-back doubles by future Brewer Roy Howell and Lloyd Moseby. Mitchell settled down after that and lasted 7.1 innings without allowing another run. Milwaukee battled back to tie the game 3-3 in the bottom of the third on Robin Yount’s two-run homer. Brewers right fielder Mark Brouhard hit a solo homer in the bottom of the sixth, but the 4-3 lead didn’t hold up. Bill Castro tried to shut down Toronto in the top of the ninth inning, but gave up a triple to catcher Ernie Whitt that scored Garth Iorg and Doug Ault. The Brewers had the tying run on in the bottom of the ninth after Robin Yount singled, but Toronto relievers Mike Barlow and Jerry Garvin shut the door for a 5-4 win. Garvin picked up his seventh save and Castro fell to 0-4 with the loss. The following game had the same 5-4 score and also had some ninth inning heroics. This time Milwaukee came out on the winning end in front of 14,034 fans. Bill Travers started for Milwaukee and Toronto sent Jackson Todd to the hill. Both teams played some small ball right away and after one inning, Toronto led 2-1. Milwaukee tied things up in the third with a double from Robin Yount and a run scoring single from Gorman Thomas. Center fielder Danny Ainge led off the fifth with a single for Toronto. The Jays took a 3-2 lead by moving him around the bases with a bunt, groundout, and base hit. They tacked on another run in the seventh with singles by Roy Howell, Danny Ainge, and Bob Davis. The 4-2 lead held up until the bottom of the ninth inning. Bill Travers had pitched the full nine innings for Milwaukee and was in line for the loss. Meanwhile, Jackson Todd came back out to try to finish off a complete game victory for Toronto. He didn’t last long. Third baseman Sal Bando led off with a solo homer. After a walk to catcher Charlie Moore, Jerry Garvin was summoned from the bullpen. He only faced Jim Gantner, who put down a perfect bunt to move Moore to second base. Joey McLaughlin was next to pitch. He walked Paul Molitor, then gave up a single to Robin Yount that scored Moore and tied the game 4-4. Mike Willis replaced McLaughlin on the mound, and was able to get Cecil Cooper to strikeout and Gorman Thomas to hit into a fielder’s choice. This left Toronto needing an out to send the game to extra innings, but Ben Oglivie delivered a single to right field, driving in Molitor to win the game. And that’s how it all played out in 1980 between the Crew and the Jays!